But it's nowhere as fun as the 2010 comedy, writes Sukanya Verma. When Abhishek Sharma’s Tere Bin Laden came out in 2010, its wacky premise and fizzy humour, involving an Osama Bin Laden doppelganger and a Pakistani reporter desperate to migrate to United States of America, made me guffaw. It was one of my favourite films that year. What it lacked in sophistication, it made up in effrontery. In his excessively boisterous follow-up titled Tere Bin Laden: Dead or Alive, most of the original’s key characters, including the one-trick pony Pradhuman Singh, return for yet another misadventure. Except the jaunt is no fun in the absence of novelty, wit and spontaneity. Sharma (characterised in Jhalak Dikhhla Jaa host Manish Paul’s overwrought expressions) starts out by parodying the painful process of directing his first film, from a jalebi maker’s runaway son to a disgruntled filmmaker whose leading man (Ali Zafar) has stolen all the credit for its success. When the news about the real Bin Laden comes out, he promptly decides to make a sequel about his killing sans the swollen-headed hero. Throw in a flaky US intelligence officer (Sikander Kher) and peevish Afghani extremist (Piyush Pandey, bushy beard-check, burbling tongue-check) wanting the fake Bin Laden dead and alive respectively for their own reasons, the spin-off could just have enough farce to amuse. Certainly, it has its goofy moments. I chuckled at the sight of Olympia E Dehshat, a gaming event featuring activities like bomb relay hosted by a terrorist camp in Afghanistan. Also impressive is the previously untapped comic potential (or any kind for that matter) of Sikander Kher. The actor is unrecognisable as the middle-aged CIA guy with a snazzy accent as well as the pot-bellied NRI producer jabbering in heavyweight Punjabi. The make-up is quite good as is the man under it. In a well-written film, he’d all you notice. Overall, however, the script is bogged down by too many clichés like theatrical news anchors and stale ideas on America bashing. A lot of jokes just don’t work; punches fall flat, laboured slapstick – overacted demonstration of overacting, birds bursting into smithereens, we still doing that? Even the presence of a paranoid Obama (Iman Crosson) doesn’t add up to much. 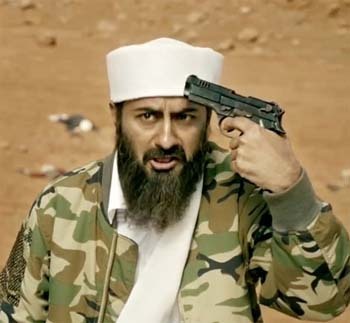 If intended to be a spoof on the vagaries of filmmaking, Tere Bin Laden: Dead or Alive is completely devoid of whimsy. And, if it aspires to be a satire, there’s little bite or ambition in its pedestrian approach and trivial resolutions.